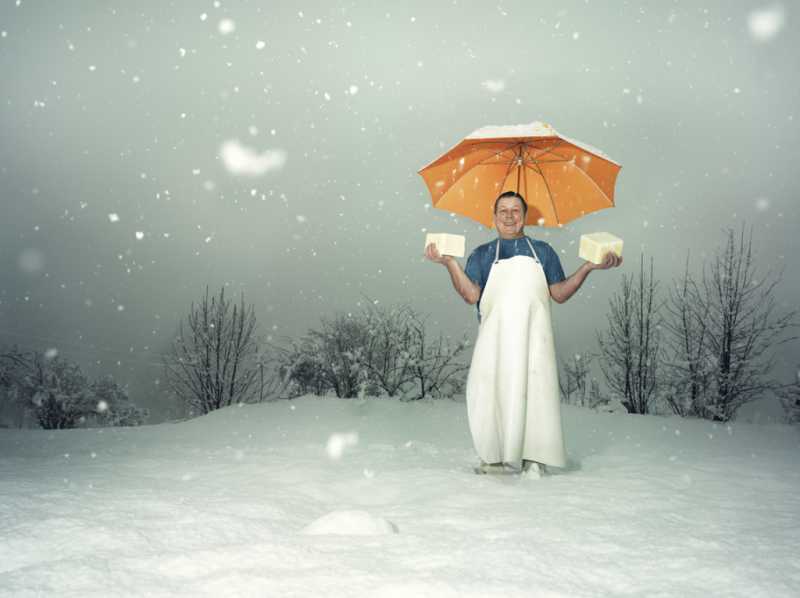 Fabian Scheffold and István Vizner’s surreal photograph of a Swiss cheese maker is one of hundreds of images from their forthcoming book Swiss Cheese Makers arriving in bookstores in late October. “I expected this to be merely an agricultural shoot, with cheese makers working in industrial settings,” Scheffold confesses. “But far from it: I met unorthodox visionary thinkers, modest and successful fellows living and working in some of Switzerland’s most spectacular landscapes. Many export their cheeses; others invent a new cheese each month; while most continue the tradition exactly as it had been handed down by their fathers.” (1996-2009) Fabian Scheffold (1966) and István Vizner (1965) have shared a passion for the visionary since first forming their creative partnership over thirteen years ago. What began as doing laid-back projects, developed over the years into a model of fine tuned and well-rehearsed teamwork that utilizes their combined knowledge and experience. To Fabian and István it is not important who did what — it‘s more important to clarify the creative goals and provide an atmosphere in which a constructive debate can take place to bring their project to a level that pushes their individual boundaries.